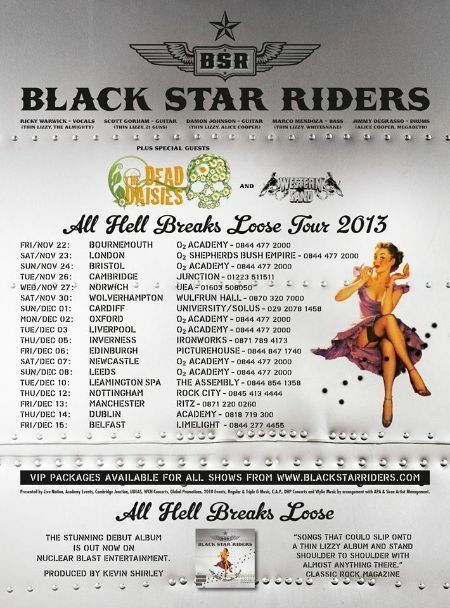 I took a few videos when Black Star Riders finished off their “All Hell Breaks Loose” 2013 tour with a show in Limelight 1, Belfast on 15th December. They were followed by The Dead Daisies (fronted by Jon Stevens of Noiseworks and featuring Richard Fortus and Dizzy Reed of Guns n’ Roses) who delivered an outstanding performance. As regular readers will know I don’t write reviews or generally read them, but those of a mind to, can check out the review posted by Jonny of Belfast Metalheads Reunited on the Rock Radio NI website.